Q&A with the Archaeologist of Johnson's Island "Tales from a Civil War Prison"
For more from Dave Bush about the archaeology at Johnson's Island, visit the Bulletin Board. ARCHAEOLOGY: In past seasons, you've excavated the sinks--Johnson's Island's privies. This year you turned to the prisoners' barracks. What did you hope the barracks would reveal? Dave Bush: I had several objectives in exploring the barracks. One of the goals was to make sure that we knew exactly where the barracks were located and to determine how they were constructed. Another goal was to explore whether some types of artifacts were unique to the barracks area and whether different blocks (barracks) had different types of artifact deposits. I was also interested in exploring what activities were indicated by the artifacts remaining. Finally, I assumed that the artifacts would shed some light on what the prisoners were given by the Union and what types of materials they were being sent by family and friends. ARCHAEOLOGY: Who lived in the barracks you excavated this summer? Prisoners or guards? Punished officers, collaborators, or ordinary Confederate officers? Do records reveal the names of residents of those blocks? Do diaries describe how one block was different from another? Dave Bush: Prisoners lived in Block 2, the barracks that we excavated this year. These were just regular Confederate officers imprisoned at Johnson's Island. There are records that reveal their names, but it is very difficult to get that information out of them. The most consistent records that have block designations are the sutler's records (he ran the prison commissary), but that list isn't easy to cross-reference for information on enough to run across information on who lived where that we include it in our studies. There are a few diaries that include lists of the other men within a given block, but these are rare. And diaries do not describe how one block differed from another in any great detail. Most of that information comes from either the Union records or just from comparing different information sources about the various blocks. ARCHAEOLOGY: What were these barracks like during the Civil War? We were marched through a door and found ourselves inside of the Prison walls. The grounds enclosed by [th]is wall is ten acres square in extent. The wall is about 12 feet in heighth [sic] of plank set up end ways, around the outside of the wall and about three feet from the top is a walk for Sentinels on duty. The U.S. Government has gone to considerable expense here in fixing up for the accommodation of prisoners of war. For this purpose houses have been erected in two rows parallel to each other with 6 houses in each row and a street between of about 50 yards in width, also one house in the middle of this street at one end making 13 in all. The buildings are framed, two stories in height with glass windows of good size and sealed inside. They are about 120 feet in length by 30 feet in width. Each building is denominated a block and numbered accordingly from 1 to 13 these are divided into rooms which are also numbered, each room being furnished with a stove and bunks for the accommodation of five & six men on each bunk a straw matrass [sic] and one blanket. To each block there is a cook room furnished with a good cooking stove and utensils to cook in, a table and cupboard & several long shelves, adjoining to this is a dining room furnished with tables and benches. Tin plates tin cups table spoons knives and forks. ARCHAEOLOGY: What major features did your excavation reveal? Dave Bush: In the topsoil (soil that has been plowed since the site was abandoned) we find artifacts that were lost, broken, or discarded by the POWs. Below the topsoil, the naturally occurring subsoil is a yellow/brown clay. If there has been some type of disturbance of these soils, we will see some type of soils discoloration or change. We found several areas where cultural disturbances (features) could be noted. These features include post molds (where support posts to the building were buried in the ground), what appears to be a trench related to the outside wall, and several other stains in the soil that we hope to explore before we have to close for the winter. We have not been able to determine any interior improvements based upon these findings except to note the location of one of the three brick chimneys. ARCHAEOLOGY: What artifacts did you find? What did those artifacts tell you about prison life? Dave Bush: We have found literally thousands of artifacts this year. Most of the artifacts are either items related to the building itself (including nails, windowpane glass, mortar) or items related to POW activities within the blocks. POW activities represented by the artifacts include items related to food preparation, storage, and consumption; items related to POW craft (raw materials like hard rubber and shell, cut glass, and prepared silver); items related to game playing and writing; and many personal items, probably lost. We know that some items were provided to the prisoners by the Union, but there are lots of items that we suspect the prisoners are receiving from family and friends to help recapture their southern life-style. These include finer china and crystal. It seems this year we found more of these types of items than we had ever found previously in other parts of the site. ARCHAEOLOGY: What will further analysis in the lab reveal about the barracks? Dave Bush: Our laboratory studies will first concentrate on getting the materials prepared for study. This includes the sorting, washing, and labeling of the artifacts. Once prepared, we can begin the longer process of analysis. The conditions at the site are not conducive to the preservation of fibers and wood except in rare circumstances. As we get further along in our analysis, we will better understand the relationship of the POW to the Union guard. This will be partly accomplished by examining what items are provided by the Union and which are being supplied to the prison through other means. 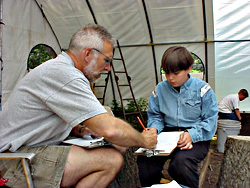 ARCHAEOLOGY: Has the mail you received in response to the story in ARCHAEOLOGY shed any new light on this summer's dig? Dave Bush: I have received many responses to the article, most from people who are descendants of POWs eager to share what they know of their ancestors' stories. I am very excited to read more of these contributions, and to further correspond with descendants. All the responses have been important to me, but two were particularly relevant, as they related details about prisoners who had spent time in Block 2 (stay tuned for their stories), where we are excavating this year. Previously I had little information directly about that particular block.